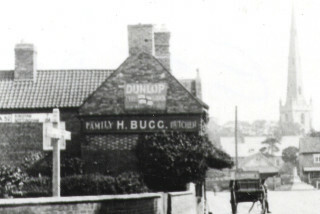 Harry Bugg's butcher's shop, on the Market Place in Bottesford, probably in the 1920s. Newspaper article in which Harry Bugg is mentioned as soloist in Bottesford Church choir. A photograph of Bottesford St Mary's choir, 1920s - Harry Bugg is ringed in red. 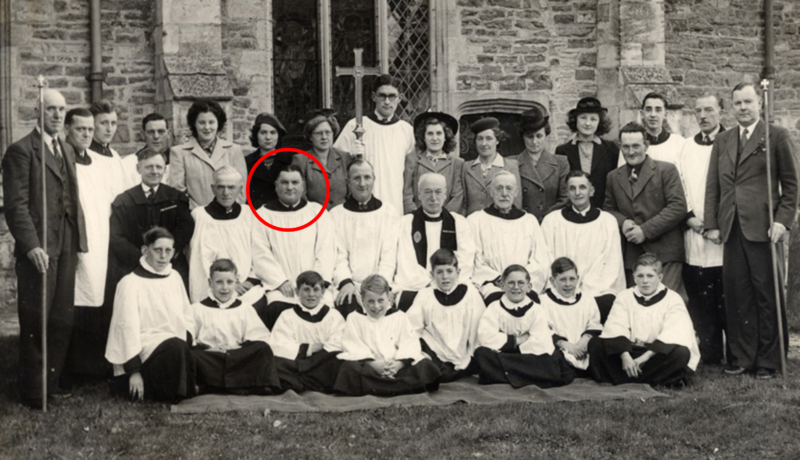 A photograph of Bottesford St Mary's choir, c.1950 - Harry Bugg is ringed in red. Harry Bugg was born in the 2nd quarter of 1891 at Caistor, near Grimsby, and died on the 31st March, 1956, aged 65, in the Lincoln area. His mother’s name was Charlotte Bugg. In the censuses of 1901 and 1911, mother and son lived with his grandmother, Sarah Bugg, at 4, Market Street. This may have been on Marriott’s Row, the row of cottages forming a small close (still there today) on the western side of the street, beyond Marriott’s/Samuel’s grocery shop, which was 1 Market Street in the 1911 census (today the White House). 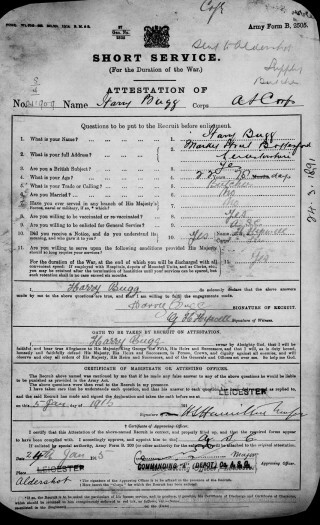 Also in the 1911 census, he was recorded as being a 19 year old apprentice butcher. 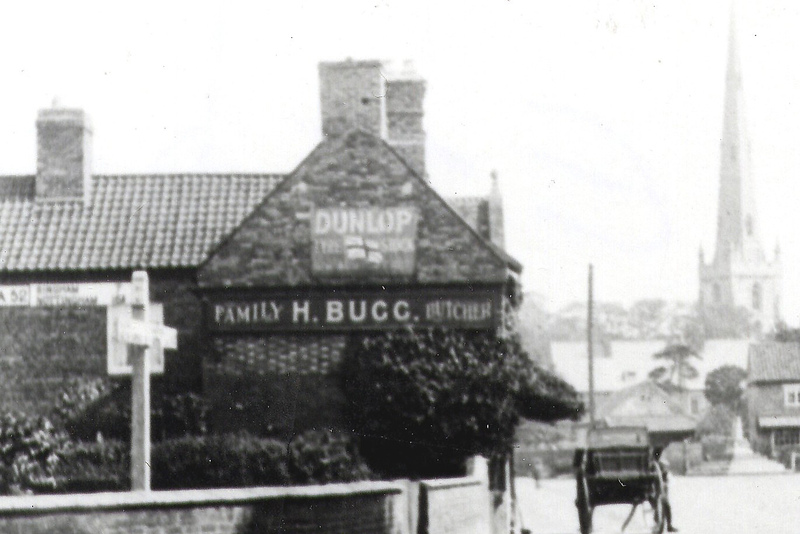 His service records indicate that his pre-war employer was butcher W. Miller of High Street, Bottesford. 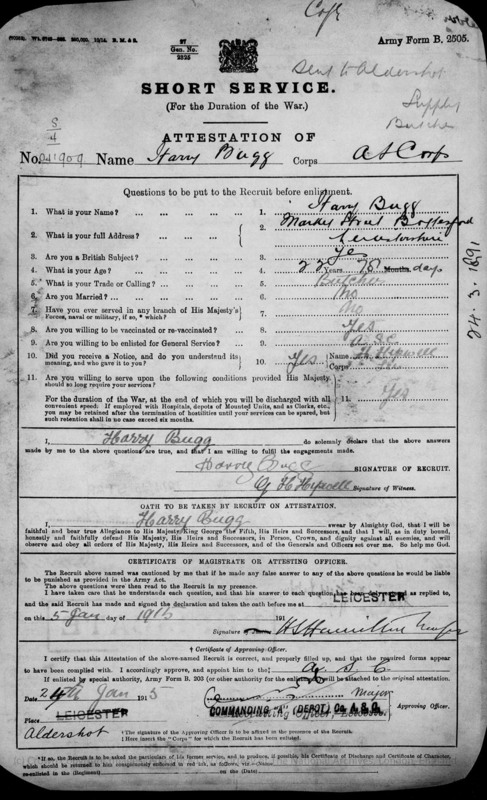 Harry Bugg attested on 5th January, 1915, at Leicester. He was 22 years old. He was sent to Aldershot, where his enlistment was completed on 24th January, 1915, as Private 041909, Royal Army Service Corps (RASC), a “proficient butcher”. He was promoted to Acting Corporal on 2nd March, 1915, and on 17th March, 1915, joined the 29th Field Butchery, part of the British Expeditionary Force. He served in France and later was stationed at Port Said handling Frozen Meat Supplies in relation to the Gallipoli campaign. Men with his skills played a vital part in keeping the forces in the field, ensuring that they received good food to the best of their abilities. It is apparent that Harry Bugg worked consistently through the four years of his service, making an important contribution to the campaign. He was promoted to Corporal on 24th May, 1919, and was demobilized in 1919, leaving Port Said on 17th June, being discharged at Woolwich on 5th August, 1919. On discharge, he returned to Bottesford. At this time, George Herbert Goodson owned the butchery business located on the western side of Market Street (Kelly 1912; Kelly 1916) (not to be confused with Taylor’s butchers shop, on the northern side of the adjoining Market Place), but by 1925 Harry Bugg owned the business. Harry Bugg married Annie Sutton early in 1925; the wedding was registered at Grantham. The Autumn 1926 electoral roll records that the couple lived with Harry’s mother Charlotte, at an address in Market St., Bottesford, probably the same small house that they had occupied before the war. He is listed in Bottesford as a butcher in Kelly’s Directories of Leicestershire from 1925 to 1941 (including Kelly 1928, Kelly 1932, Kelly 1936). He was also known as a skilled beef farmer: as an instance, the Grantham Journal, 17th December, 1938, reported on prizes given at the Grantham Fat Stock Show, including “Class 2, pair of bullocks reared and fed by exhibitor” for which the first prize was awarded jointly to Crown Farms, Pointon (Harris, £27, and Bugg, Bottesford, £26). 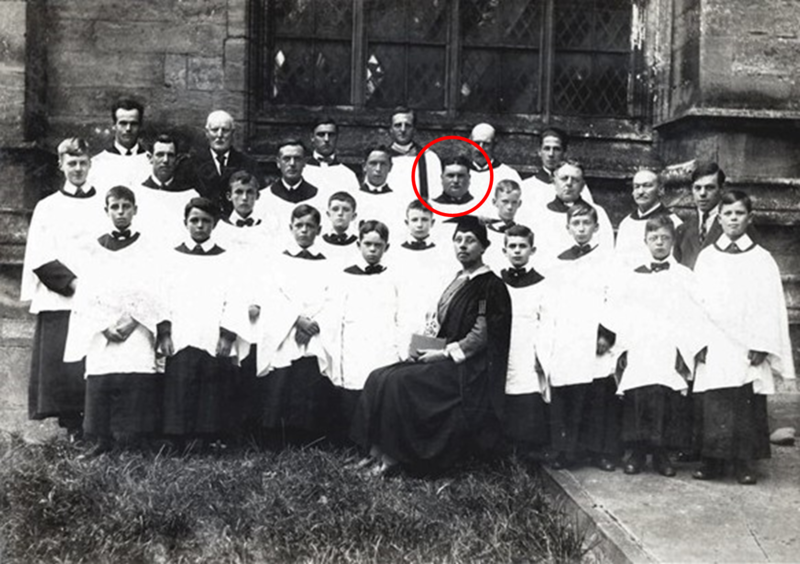 He was a member of the choir of St Mary’s, Bottesford for many years, pictured in two photographs of the choir taken several years apart in the 1920s and after the end of WW2. 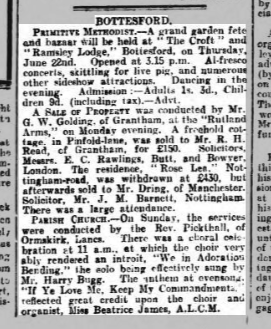 On the 17th June, 1922, the Grantham Journal, describing the service of the previous Sunday at St Mary’s, led by the Reverend Pickthall from Ormskirk, Lancashire, reported that Harry Bugg was soloist in the introit “We in adoration bending” which was “sung effectively”. Harry Bugg died on the 31st March, 1956, aged 65 years.